The bark darkens and roughens near the base of older trees, while becoming fissured with broad, grayish ridges on the upper trunk. The tree grows on rich, well-drained soils. It occurs commonly throughout most of Ohio, except in poorly drained or swampy areas. The wood is similar to that of the White Oak, and although more porous and less resistant to decay, is used extensively in construction and interior work. 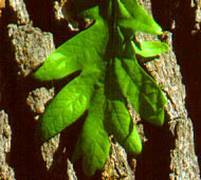 The Red Oak grows more rapidly than most oaks and is useful for planting in residential areas. 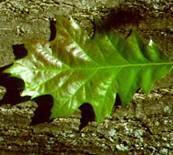 The acorns are not as tasty as those of the White Oak, but many kinds of wildlife feed on them. This is one of the largest trees of forests in the eastern United States. The tallest known in Ohio today is an 84-foot tree in Mahoning County. The distinctive bark is light ash-gray in color, and often fissured into scaly plates. The tree grows best on deep, well-drained upland soils. Still, it is found in a wide variety of habitats throughout Ohio, probably occurring in every county. The close-grained, strong wood is one our best for furniture and hardwood flooring. 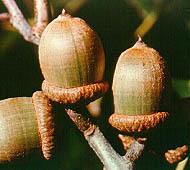 Native American Indians made flour from its acorns. 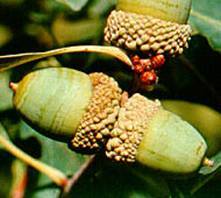 Both Indians and early settlers boiled the acorns to make them more palatable. Many kinds of wildlife feed on the acorns as well. PRESIDENT, TOM COWAN CALLED THE MEETING TO ORDER AT 7:00 PM. WELCOMED GUEST WERE: Howard Vaughan, Larry Bowers, Rick Benney, Marvin Moore, B. A. Niles, Judy Davis and Mary Ellen Linsey. Announcements: Henry Davis has copies of Splinter’s available. Jim Roy is promoting “creations in wood” by announcing the show dates as follows: Winchester Library April 17, 18 19, 20 and 21, 2000; Tullahoma Library April 25, 26, 27, 28, 29, 2000; and Manchester Foothill Crafts May 2, 3, 4, 5, 6, 2000. Jim showed a video of the exhibits from the 1998 “Creation in Wood”. Excellent wood working projects were illustrated in the film. Harold Hewgley passed a sign up sheet and asked members to sign up to work during the Winchester exhibit dates. Henry Davis announced that he is the transportation chairman for the exhibits and will help in transporting the exhibits from the different show locations as well as assist any one in need of help with delicate articles. Chairman Tom Cowan showed a video of a recent Tennessee Cross roads TV program that highlighted Loyd Ackerman showing how to turn tagua nuts from South America into unique articles. The film also showed some of Loyd’s furniture that he has built which illustrated his skills in woodworking. Phil Bishop shared a safety tip with the group by showing a badly injured finger that he had recently injured while ripping a board on his table saw. Point made was to always use a push stick when ripping a piece of wood. Loyd Ackerman- a tall plant stand made of cherry wood. Doyle McConnell-desk drawer made of cherry and a “religious bowl” made of holly wood. Andy Weaver-router jig made from pear wood, hickory box and a bowl. Henry Davis- Two small bowls made from mulberry and a large bowl made from maple wood. Ted Baldwin- a small high chair made from maple wood. Ken Burgess- carving of “Moses as a shepherd” from butternut wood. Also, showed some of his grandfather’s old wood working tools. Ross Roepke- rolling pin with walnut handles and center with Maple wood on the outside. Also, a box frame and a game made of wood. Maurice Runyon-game board made from cherry wood. Don Helton- a Titan logo with a penholder made on a scroll saw. Also, a small chair and swing made from red oak wood on the scroll saw. Manuel Brown- a bowl and a plate made from various pieces of wood glued together. Bob Reese illustrating the techniques of gluing and clamping of wood presented the program. Bob explained different types of glue and their applications to the woodworker. Also, illustrated different clamps and their application in clamping a variety of woods being clamped. Craftsman lathe 12 inch with stand, two tool rests, two four inch face plates, three face plates with screw centers, spur, 60 degrees and live centers, and a six inch four jaw chuck. $150.00. Also, an antique post vice $100.00. Phone: 931-389-9736. There were 61 in attendance. Respectfully submitted, John Mayberry, Secretary. Why don't trees just keep growing? If they did keep growing we would have no poems about the birds in the treetops because we couldn't see or hear them. And California would lose tourist revenue because its redwoods would no longer be special. But it's not likely that trees curb their growth strictly for our convenience. So why isn't the typical tree a long-limbed, lumbering Leviathan? A tree's ability to get water to its highest branches sets a practical limit to its height. Water, as sap, progresses up a tree because the liquid usually maintains itself in a narrow column, the molecules of which adhere to each other. Leaves are able to pull the tops of these columns up, sucking in the nearest molecules like water from a hose. But over great heights the columns break, weakening the process, making gargantuan trees impractical and nearly impossible to grow. That's the root of the matter. Home Depot seems to be leading the way with environmental concerns. Here are some that are on their web site. As a home improvement retailer, we have worked diligently to educate ourselves and our suppliers about important forestry issues. In fact, The Home Depot was the first home improvement retailer to pioneer the U.S. market for wood products certified under the principles of the Forest Stewardship Council (FSC). Our Timber Task Force is continually striving for improvements in forest management practices. Royal Mahogany Doors from a certified forest in Costa Rica. Premwood Doors, an alternative to lauan interior doors. FSC-certified dimensional lumber from one of our largest Canadian suppliers. Flooring underlayment made from recycled newspapers and gypsum sold as replacement to lauan flooring underlayment. Rest assured, as more of these products become available, The Home Depot will carry them. and economically viable. Teams of qualified experts conduct these evaluations using internationally applicable principles and criteria developed by the Forest Stewardship Council (FSC) - an international, non-profit organization that establishes standards, and accredits and monitors certification organizations. Forests that are managed to meet FSC standards can be certified as "well-managed." Certified wood comes from Certified Well-Managed forests. The Certified Forest Products Council (CFPC) studies and evaluates the various forest certification and management systems that exist in the marketplace, both domestically and internationally. The Forest Stewardship Council's principles and criteria comprise the only system that currently meets CFPC's criteria for Certified Well-Managed forests. Only products made from this wood can be labeled in the marketplace as "FSC-certified." To carry this label, the wood must be tracked from the forest, through manufacturing and distribution to the final point of sale. This process is known as chain-of-custody. It assures that the wood was indeed produced from a Certified Well-Managed forest.